Dean Schwaab in Osaka Prints, p. 154, says: "This print gives neither actor nor role. It is very delicately but clearly printed, with the grass cloak in gauffrage and the dark robes richly overprinted with metallic brocade patterns. The quiet, softly shaded snowscape, with the hint of spring in the running water and bird, perfectly offsets the foreground figure. The poems are written in silver and seem to fade into the snow. They celebrate the spring season." 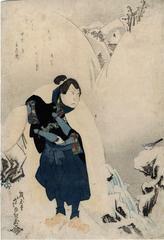 1) In Ikeda Bunko, Kamigata yakusha-e shūsei (Collected Kamigata Actor Prints), vol. 1, Osaka, 1998, no. 301. 2) In color in Ukiyo-e Masterpieces in European Collections: Musées Royaux d'Art et d'Histoire, Brussels, vol. 9, Kodansha, 1989, #245.